Get Carlo Pacis to personally send you his new posts. This is the second edition of my Trending Titans series, which focuses on finding out what makes the biggest brands on social media so effective in their marketing, and how you can apply these things to your business. Previously, I covered Instagram in Trending Titans: 6 Lessons Taught by Instagram’s Biggest Brands, which featured Nike, H&M, and the NBA. This post covers Facebook, a platform that needs no introduction. Since its creation in 2004, the social network has grown to nearly 1.6 billion users (in comparison, Instagram and Twitter have 400 million and 320 million users, respectively), the highest by far of any social network. The point I’m trying to make is this: Facebook is big. Really, really big. If you’re looking to grow your business through social media (speaking of which, here’s 75 tips for doing that), you’d be hard pressed to find a better platform than Facebook. So, without further ado, here’s 6 great tips you can apply to your own business’ Facebook page, straight from 3 of the biggest: Red Bull, Samsung Mobile, and Skype. For me, seeing a brand that doesn’t interact at all with its followers is the social media equivalent of stepping on a LEGO brick. It hurts. 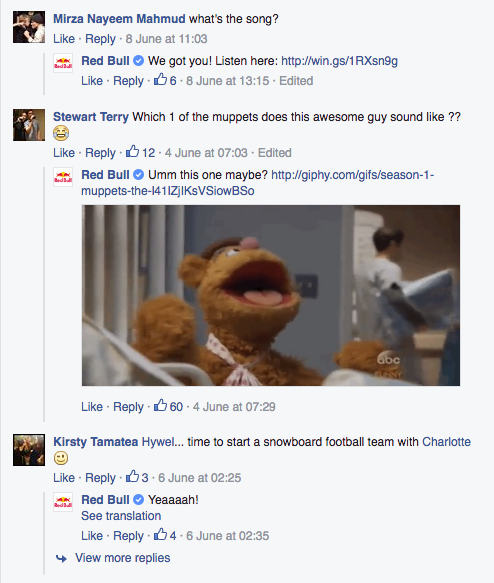 As you can see in the examples above, Red Bull makes it a point to reply to many of the questions and comments it receives on its page. This seems trivial, but it’s quite a feat for a page with over 45 million likes. And that means you - whether your page has 45, 4,500, or 4,500,000 likes - have no excuse not to be addressing your fans and followers. I’m not saying every question needs an answer or that every comment needs a reply, but remaining connected with your following gives your company life, personality, and most importantly, helps the people who support you see your commitment to building a brand that cares. 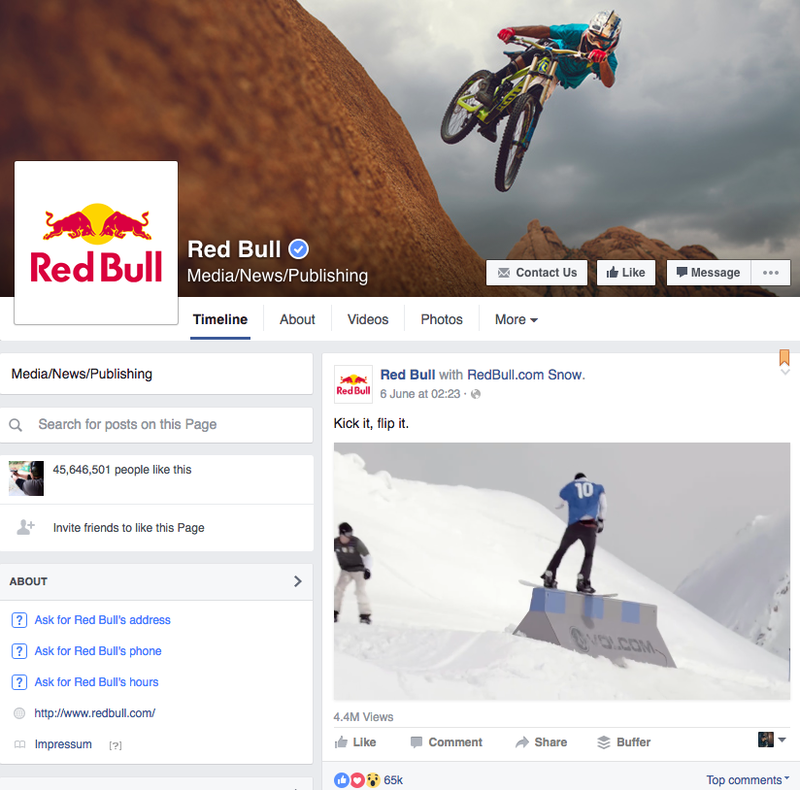 Guess how many times Red Bull - the #1 energy drink in the United States - mentions energy drinks on its Facebook page? That’s right. It doesn’t mention energy drinks even once. At first, it seems counterintuitive. Why bother marketing on social media - especially a platform as popular as Facebook - if you’re not even going to attempt to sell your product? Well, they are, sort of - they’re just going about it totally differently. As you can see in the screenshot above, all of Red Bull’s content has to do with extreme sports, an industry Red Bull has forged a deep relationship with over its lifespan through frequent sponsorship of sporting events and teams (most notably Red Bull Stratos). So the question is: why? Well, let’s look at Red Bull’s product: an energy drink - not exactly the easiest product to differentiate from competitors, most of which have the same orange-flavoured sugar-free double-size triple-caffeine (or what have you) offerings Red Bull does. The energy drink industry has been around for quite a while now, and it’s full of companies trying to market - essentially - the same product, which means companies need to compete largely through branding. So, if you find yourself competing in a saturated industry consisting of largely homogeneous products, don’t be afraid to market aggressively through unique, original content that exemplifies the image you want your brand to have. And that can be the case if, like I mentioned, you’re competing in an industry where product differentiation is low. However, if you feel like you’ve got a unique product that could become the next iPhone, you need to let people know! Samsung, a company that prides itself on remaining on the cutting edge of technology, posts - in stark contrast to Red Bull - only content that showcases its many products. Samsung does a great job in marketing the benefits of its products through short, creative videos. Ensuring your audience is aware not just of the features, but the benefits of your products is essential when you’re trying to sell them on something new (and possibly foreign). If you’re not certain of the difference between a feature and a benefit, think of it like this: a feature of a fuel-efficient car might be that it runs on electricity; the corresponding benefit is the money an owner saves on gas. The bad news is Facebook probably knows everything about you. The good news is, Facebook knows a lot about everyone else, too - and you can use that to your advantage. One thing you’ll notice as you make your way through Samsung’s Facebook timeline is that they reference - and directly tag - other brands left and right, whether that’s through a Batman-themed smartphone or Snoopy on a watch. 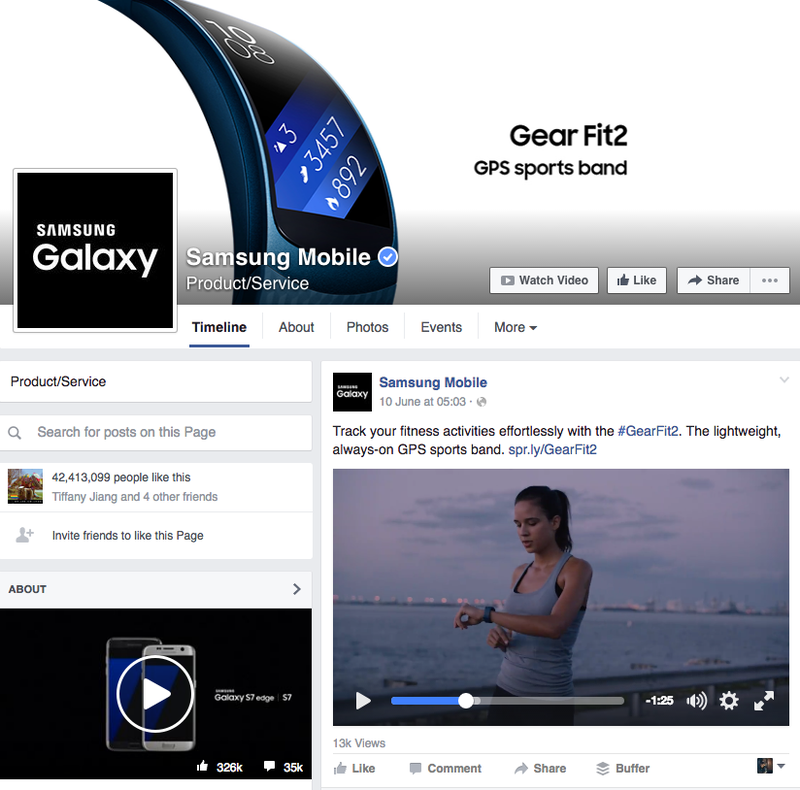 Chances are, Samsung has partnerships with these brands - but you don’t need to in order to do the same! You can take advantage of this tactic by, for example, doing something as simple as posting a photo of your new nifty gadget next to a (seven-dollar) cup of coffee with a caption like “Thanks Starbucks for keeping us going throughout the day!”. By doing this, you’ve now given yourself a chance to appear on the newsfeeds of people who like Starbucks, or whatever company you’ve chosen to tag. Think of this as piggyback marketing! How’s that for vague? It’s true, though - the more unique the content you post on Facebook is, the more likely it is to generate buzz and attract an audience. This is particularly important for companies selling things like software or services, who usually don’t have the luxury of posing with their product in scenic locations. A great example of a company doing creative things on Facebook is Skype. Instead of simply posting about the app’s new features or pushing for new users, Skype has a heavy focus on people. 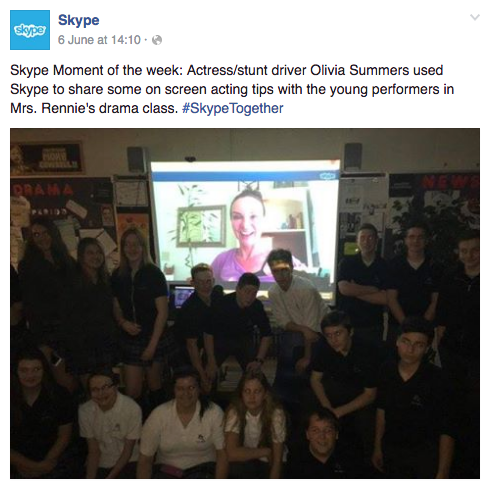 In particular, it highlights people who have benefited from their software, like this drama class who used Skype to get in touch with an actress and stunt driver! Take chances: don’t be afraid to go outside of the box and generate content that showcases your product in a different light. Of course, every audience is different, so make sure you’re keeping a close eye on your analytics to see just how yours responds to the different types of content you post. This series is called Trending Titans for a reason! Within today's social media landscape, it's of utmost importance that you remain current. Skype does a great job of remaining on top of trends that pop up on social media. 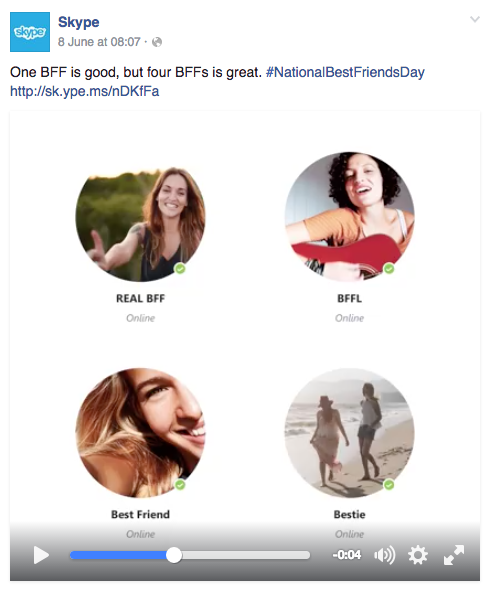 You can see this in the example above, where they created a cute video clip of best friends connecting for #NationalBestFriendsDay. This is a great way for your business to reach social media users who you might not otherwise reach, as they tend to browse popular hashtags or topics on their platforms of choice. To be effective, however, you need to respond quickly. Remember that one day in real life is one year in social media, and trends go just as quickly as they come. If you’re looking for more great Facebook tips, check out this article on getting your page those much-deserved likes. If you enjoyed this post, let me know in the comments below and make sure to read my previous Trending Titans post about Instagram. I’d also love to see which brands you think have been doing great things on Facebook. Wishpond's platform makes it easy to get the most from your Facebook buck with mobile-optimized landing pages, Facebook contests, and lead nurturing tools. Check us out today! Carlo is a Content Marketer at Wishpond who lives and breathes all things social media. He also has an obsession with music, sneakers, and coffee. Follow him on Twitter or Instagram @carlonathan.